There is one key that has been a perpetual bane on the modern keyboard. It's usefulness is so limited as to be laughable, and it's usefulness is really only a momentary convenience. 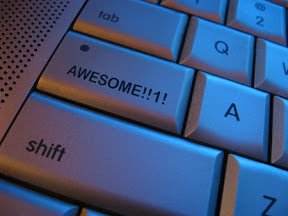 In all of the writing I've done, and all the reading I've done, I've never really found a use for the Capslock key. It just sits there on the edge of the keyboard taking up useful space. I'm more likely to hold onto the shift key to type out capitals. Finally, though, there is a solution. I introduce you to Autohotkey a wonderful little scripting tool which can, among many things, remap keys on the keyboard. No, it does not take a degree in programming to use this program. In fact, I'm going to just give you the script I use to remap capslock to something useful. My script remaps capslock to become CTRL+I, which turns on italics in all major word processing programs, a typeface I find infinitely more useful in writing than all capital letters. Change the I to a U or a B, and it becomes underline or bold, respectively. More than that, I still have a way to enable the Capslock mode by holding down the shift key, then hitting Capslock. to turn Capslock off again, I repeat with shift and Capslock. To use the script, simply download the program from the link above, open up notepad, and copy the following two lines into it, and save the file as filename.ahk (the extension is important). And that's all there is to it. The possibilities are endless with Autohotkey, and several sites post up their own scripts for users to download and use. I've got another one that lets me put in the nice little indents to my blog paragraphs, but that's next week. For more information on Autohotkey, here is a nice little write up about it on Lifehacker (a favorite site of mine).